Cromodora 14x5.5 Beta rim weigth ? Lancia Beta Forum > Technical stuff > Wheels/Tyres > Cromodora 14x5.5 Beta rim weigth ? somebody has weighted with some precision the 14 x 5,5 original beta alloy rims? For example not sure if for the 8 spokes it is beetwen 14 and 16 pounds (6,3 - 7,2 kg).. I put pictures of n1 n2 and n3 .. Thanks to all. Re: Cromodora 14x5.5 Beta rim weigth ? If the wheel you are refering to is the "classic 8 spoke Cromodora", I have one of these wheels sitting in my garage doing nothing, without tyre, weights or valve, and I have weighed it for you on some ex Post office scales! It weighs in at 5.5kg exactly. I believe that later on the same style wheel was made by some one else, and it is rumoured to have been lighter still. It remains to be seen how light the other earlier model magnesium wheels were? I would love to know. I am sure that the early berlina/HPE alloy wheel in its lighter version is by far the lightest Beta wheel, if i remember correctly the light version has a very slightly different centre design and lacks the cast in 'originale lancia' of the heavier version. the difference when picking up the wheels is very obvious you don't need to weigh them! I modified my first answer and added pictures! Thanks to all. of 14 X5,5 and the alloy of some years ago! but also 6 kg will be extremely good. but some danger about resistance when rim is been already used long time.. The FPS version of the 8 spoke alloy weighs in at 6kg. No tyre no valve & no weights. It remains to be seen how light the other earlier model magnesium wheels were? I would love to know. I am surprised that the "bog standard Cromodora 8 spoke" came up so light, as I was informed by another member recently that the FPS version of that wheel was probably lighter still! I must stress that it was measured on good accurate level Post Office scales, so I don't think it's a fluke. (However I have recently cleaned all the years accumulated crud out from the back, so that the Shotblaster has an easy time of it when he refinishes it)! These for reference are the same type and manufacturer of wheel that I recently posted some pics of after painting. See forum under "Wheels". expecially if used with a "soft" tyre with an high shoulder like the 185/65 14. Probably at 6 kg it is a little lighter than the iron rim (that is not as beatifull to see). to the weight of the car to see their effect on confort (suspension response on bumpy road). Indeed for accelerating performance the rotating mass in the wheel must be multiplied "only"
for 1,5-1,8 times (Inerzia laws), so having 6 kg instead of 7-8 kg for 14 rims does'nt change pratically nothing.. Still pleased of the good stuff lancia used for rims in 1980! Alloy rims of series cars in the '90 for the measure 14 x 5,5 were at least 7,2 - 7,8 kg (the lighter ones). Anyone weighting the 16 or the 20 spokes? 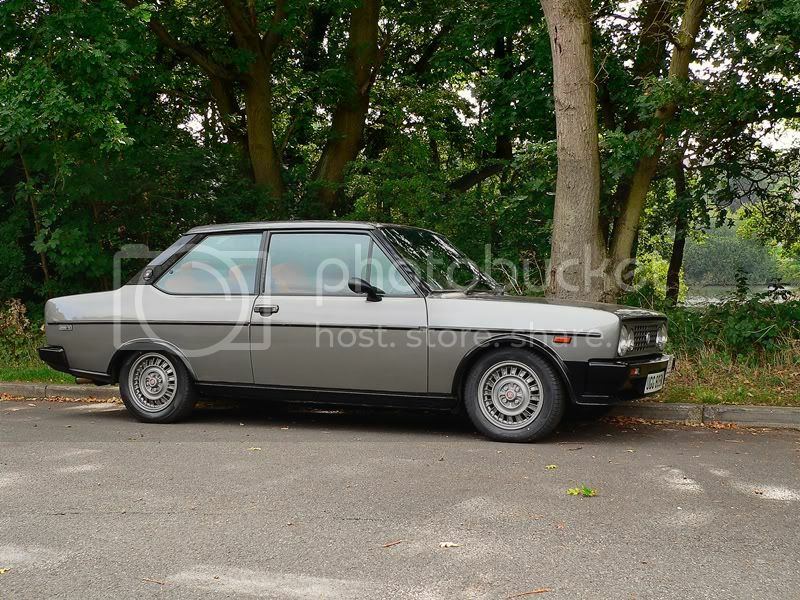 I have a set of the Cromodora CD51 (or 16 spoke as referred to here) wheels fitted to my Fiat 131 (most Fiat 131 'aficionados' hate them but I quite like them ). I still have the fifth (spare) wheel without a tyre so I can weigh it this evening. But bathroom scales accuracy is the best I can offer. thanks for posting the pics of those lovely wheels and that gorgeous Fiat Mirafiori Sport you have. I had one of these in the late 80's, same colour, same orange interior, same everything. I have owned a fair amount of Fiats, Alfa's and now Lancias, (and at the risk of upsetting some of our Lancisti out there) but pound for pound I firmly believe that the Fiat 131 Mirafiori Sport, although underated and largely ignored was one of the best drivers cars of the time. Dare I say like a RS2000, only better, much better! I drove mine till the floor finally fell out, and the crankshaft seized. Wonderful. It embarrased many an XR3i owner, and even scalped some BMW 3 Series on occasion. That perfect blend of Italian Twin Cam and rear wheel drive was fantastic! is finished soon I look forward to comparing the two! I can weigh it this evening. Great Sound Theo, It reminds me of my youth when I coulden't afford a Lancia so I bought a 131 instead. Oh memories !! I´m Urban from Sweden,I´ve been following this site for years but not been heard much!I have a couple of Lancias,among those a Beta Spider 1979 which I have been driving mostly summertimes for,I can´t believe it,ten years!Its originally silver with black interior but during the eighties repainted in red. What do you mean by "elektron"? CD51, CD53, CD160 or any other? The weight suggests they are magnesium rather than aluminium. Campagnolo uses the name "elektron" for the mix of metals they used for their rims,magnesium,aluminium and something more i cant remember,Zink maybe. for competition purposes or maybe leftover metal from some other project? Sorry, I dont know the numbers of the different Cromodoraforgings,CD 51 for instance,is there anyone that have any info on that,or a "Catalogo" ?? I have magnesium CD53, they look similar to CD51 that were used in early HPEs and berlinas. Very interesting,I will have a closer look at my Cromodora "lightweighters"!